Junior footballers from the Derbyshire area enthusiastically turned out to train at the Proact Stadium on Saturday the 16th May as part of a fundraising launch to help MacMillan Cancer Support raise funds for their Chesterfield based Cancer Centre. The Chesterfield Royal Macmillan Cancer Centre campaign needs to raise £2.5 million towards the brand new, state-of-the art, purpose built building which will provide access to treatment, care, support and advice for many people in our community. Donate today and help Macmillan support people living with cancer and their families. 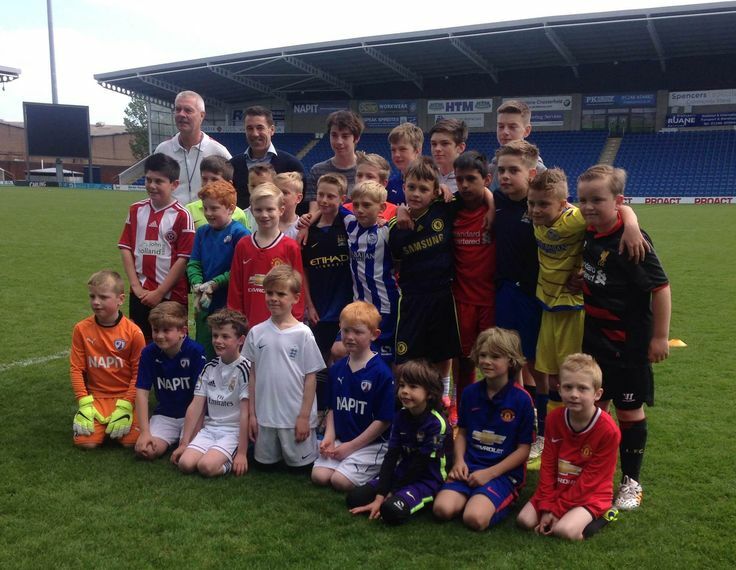 Juniors aged between 7 and 13 took part in a training session on Chesterfield FC's esteemed pitch whilst spectators and Spencers staff contributed generously through donations, a raffle and a football themed quiz. Dean Saunders, recently appointed Chesterfield manager, popped in to say hello and cameras were soon snapping away. Whilst the juniors were honing their skills on the pitch, spectators were taking part in a prize raffle draw and football-themed quiz. Prizes up for grabs in the raffle included a signed Chesterfield FC shirt, signed football, a Cineworld gift card, Chesterfield FC match day tickets, bottles of wine and chocolates. With ticket strips costing just £1, many spectators were seen diving into their pockets for the chance to win one of the fabulous prizes on offer. Tension was rumoured to be rising during the football quiz until one competitive spectator, Louise, was presented with a bottle of fizz and declared quiz champion. Post coaching, medals were awarded to recognise outstanding skills on the pitch and all session attendees were presented with award certificates for their participation and effort throughout. "The event was enjoyed by everyone who was involved and we raised a grand total of £175.00. Grateful thanks go to Brent Marsh who expertly facilitated the training session; to Chesterfield FC for its hospitality and raffle prizes and of course; to everyone who contributed and came along to support such an inspiring and much needed local facility." See our Pinterest board for more photos from the session and please visit http://www.macmillan.org.uk/donate/macmillan-projects/chesterfield.html to donate to the Chesterfield Royal Macmillan Cancer Centre.